#2. The people in my life reflect aspects of myself. I am a composite of every person who is important to me. I am going to look upon friends and family as a group picture of me. Why do I start these things? I'm not sure this one is going to be fun since I doubt that I get to assemble just the best parts of my friends and family and say, "There I am." I think this means that I have to also look at their lesser parts and find those reflections in myself also. Where to start? One of my friends is in the midst of a nasty lawsuit after having been betrayed financially at a time when life had just dealt her a severe blow. She has a lot of righteous anger about the situation and it has claimed a good deal of her attention and time. When we talk about this, it is easy for me to see that, at least at some point, she will need to let go of the anger and forgive the other party. But, for right now, she feels like she needs to hold on to it in order to "do battle with the enemy." How is this reflected in me and my life? What am I holding onto in order to protect myself? What enemy do I need to forgive? I know I protect myself with my strength and independence and project that I don't need anyone else to help me. If I truly believed in unity, I would know that I am part of everything and quit pretending that I am a separate entity capable of existing independently. I am deeply interconnected and any vibration on the web reverberates through me. My friend's world has been rocked by pain and betrayal and she believes she isn't safe, that she needs to defend herself. While I have survived my own rolling shock waves of death and loss, I am still trying to hold my world and my self together with my own fingers rather than going fearlessly forward into life knowing that I am safe. Her fear reflects my fear. She has a specific "enemy;" I am treating "life" as if it were my enemy. Attempting to defend myself against its potential jolts rather than knowing that I am safe and that whatever life brings, I'll still be safe. I need to accept that life is always right. This morning as I sat in the airport waiting for my flight back to Denver, I watched the story of "Super Susie" Weadock-Mann who died yesterday. After the 79-year-old woman was diagnosed with terminal cancer, she refused to spend her time in chemotherapy and rather began to attack her "bucket list" with gusto. She sky-dived, hang-glided, rode off road on 4-wheelers through the west ... she lived her life as a daredevil. Her cancer gave her the gift of fearlessness. What if I could live my life from that same place of fearlessness? What if we all focused on our bucket lists and let go of everything that keeps us outside the joy stream of life? What a different world it would be. Fabulous image, Joyce. Is this a result of your art immersion? I can accept that each experience in our life has something to teach us, if we are open to accepting the lesson(s). I'm not so sure that means the same as "life is always right". Could "life" instead mean "God"? Finding the source of fear then understanding it to overcome it are first steps to living joyfully. These are great questions you ask. The idea of oneness is particular to the Bah'ai faith. Do you know if Chopra is drawing on that at all? What a powerful post. If I view all the stuff that life has thrown at me in this last year as a reflection of me, and as I write this I know it is true, it has got to be the biggest lesson and opportunity for me. But in the midst of this, boy it is so much easier to be angry, blame, criticize and imagine that all this is done to me... I need to constantly reming myself that what they do is not about me, but for me. There is a blessing, an awareness about me, a salvation, freedom from my own believe system, hiding somewhere inside this chaos... for me. Being a dare-devil does not excite me in the least, my challenge is being intimate in relationships. Somehow I can't post as me, so I need to do it as anonymous. Joyce! You are my hero. What a powerful post. I must run off to 'do battle' with the world of homelessness -- and I'm carrying your words with me. They are great pause for reflective thought. PS have you ever looked at A course in miracles? So much of Chopra's work reflects the foundation of the ACIM. Hi Maureen, Doris, and Louise ... nice to have you on this journey. One thing I really appreciate is how much the different traditions reinforce this thinking. Chopra's background is Buddhist (I think) but there is so much overlap with the Course in Miracles, Bahai, Sufi ... and Christianity (if you look at it just right). When everyone is saying the same thing, it carries a lot of weight. I think "Make life right" is about making God right ... rather accepting that everything is right. 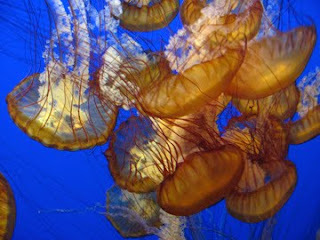 And, the image is actually just a shot of jelly fish at the Monterey Bay Aquarium ... aren't they just incredible?